Treeswifts are a small Asian family of four similar species, all within the genus Hemiprocne. Among them is the striking and colorful Whiskered Treeswift (left; dorsal and ventral views of the same bird). Its range is restricted to the Malay Peninsula, the Philippines, Borneo, and Sumatra. It is a forest species, mostly found perched near the canopy on a dead tree or other observation point, from which it makes short sallies to catch flying insects. The one photographed here was using a crossbar of a canopy walkway some 100 ft. above the forest floor for its perch, and I took these photos while trying to avoid swinging the walkway from side-to-side! Fortunately the lighting was very good, and the birds iridescent colors show nicely. Whiskered Treeswift is the only one in the family to have this foraging technique. The remaining species capture their insect prey in gliding flight over the tree tops, or over rivers and open country. The Gray-rumped Treeswift (right) is found on the Malay Peninsula, in the Greater Sundas, and on Sulawesi. At one time it was considered conspecific with the similar Crested Treeswift Hemiprocne coronata of southern Asia (India to Indochina), but their ranges overlap in s.w. Thailand with no evidence of interbreeding. The final species in the family — Moustached Treeswift H. mystacea of New Guinea and islands groups both east and west — is the largest. It, like Gray-rumped and Crested, forages primarily in the air. 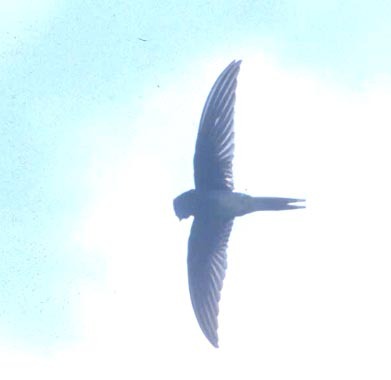 All four species of treeswift were described for science between 1802 and 1833, and both Gray-rumped and Crested were initially included in the old inclusive genus Hirundo, "making the Crested Treeswift possibly the last of many species ever to be wrongly classified as a swallow" (Wells 1999). Because treeswifts forage rather like swallows, and have glossy plumage, they were once thought to be a missing link between swifts and swallows, back when swifts and swallows were considered closely related. We now know that these groups are not related at all, and that treeswifts are a very distinctive group allied with swifts. They differ from swifts, however, "by details of cranium shape; the form of the skeletal palate; the anatomy of the tarsus and deep plantar tendons operating the digits; the non-reversible hind toe associated with branch-perching; the lack of a claw on the manus; and the soft, passerine-like feathering, with a patch of downy plumage on the flank" (Wells 1999). As a group, treeswifts occur in a wide range of natural habitats, from mangroves to evergreen hill forests, but all are to some extent dependent on forest. No species can survive the total clearance of tall forest trees or a monoculture of planted oil palms. Whiskered is very much a forest species while the others prefer the edge or open country near forest. Nests are placed at the end of small, thin branches in the branches, fully accessible to the flying parents but on such thin, outer tips as to provide protection from their major nest predators: snakes. This placement does make them vulnerable to avian predators — like falconets — and parents routinely dive-bomb these tiny falcons when they approach too closely (Wells 1999). To date, all species of treeswift remain widespread and common. They are attractive and engaging components of the Oriental avifauna. Close encounters, though, are rather scarce and thus likely to be remembered and appreciated. Photos: The Whiskered Treeswift Hemiprocne comata was photographed on the canopy walkway at Borneo Rainforest Lodge, Danum Valley Conservation Area, Sabah, Malaysia on 7 Aug 2003. The flying Gray-rumped Treeswift H. longipennis was in flight, among a dozen others, over Borneo Rainforest Lodge two days later. All photos are © 2003 Don Roberson; all rights reserved. Chantler, P. 2000. Swifts: A Guide to the Swifts and Treeswifts of the World. 2d ed. Yale Univ. Press, New Haven, CT.
Treeswifts are included in this family volume, the second edition of which was published in the U.K. by Pica Press, but in the U.S. by Yale. It is in the standard format of whole series of Pica Press family guides, with color plates found separately (with facing page captions) from the text, giving the feeling this is meant to be a field guide. The paintings are by Gerald Driessens, who was listed as a co-author of the first edition but that co-authorship was dropped without explanation in this second edition. The one color plate devoted to treeswifts appears to be an afterthought, and I don't feel it captures the look or colors of these birds vat all. For example, Gray-rumped Treeswift has a lovely greenish sheen to the head and back that is not shown, and it is quite a bit larger than Whiskered Treeswift, but this distinction does not come across very well. Some of the plates of swifts are nice, but this one on treeswifts is too crowded. My detailed review of this 2nd edition of Swifts appeared in Auk 118:274-277 (2001), but I considered only the Apodidae text and did not comment on the Hemiprocnidae discussion. Short version of my review: as to swifts, the book is pretty good for Old World species (but there are exceptions), very uneven on South American species, and inexcusably poor on North American species. As to treeswifts, the species accounts seem to be okay but there is only a cursory discussion of the group as a family, leaving one wishing for a lot more. The family is now well-covered by David Wells (1999) in the Handbook of the Birds of the World series. The one-page color plate by Chris Rose is much improved over the Driessens' page in Chantler (2000). There is extensive family text and 7 color photos. For this family, the HBW chapter is far superior to the Chantler chapter, excepting, perhaps the greater detail on subspecific differences in Swifts. Wells, D.R. 1999. Family Hemiprocnidae (Treeswifts), pp. 458-467 in Handbook of the Birds of the World, Vol. 5 (J. del Hoyo, A. Elliott & J. Sargatal, eds.). Lynx Edicions, Barcelona, Spain.